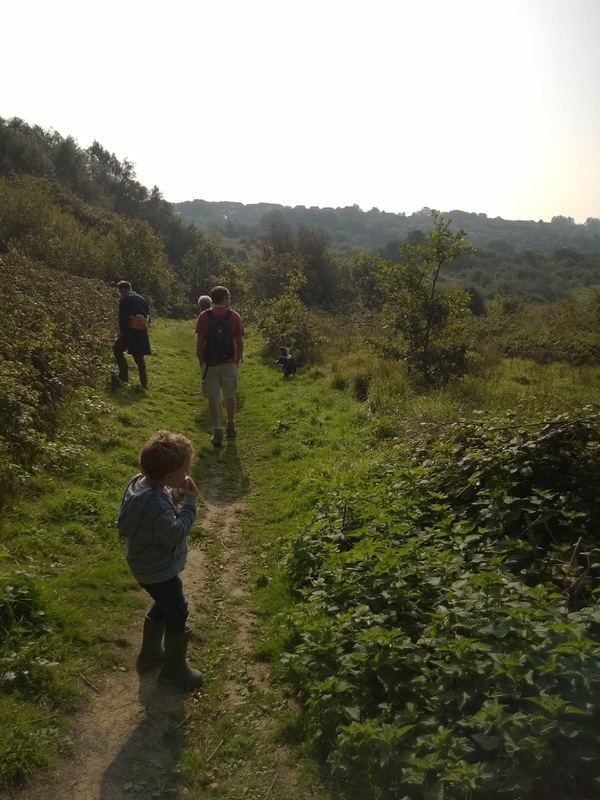 Hastings and St Leonards Transition Town is part of an international Transition Towns movement to work towards healthier, more sustainable, more self-sufficient, more connected communities. 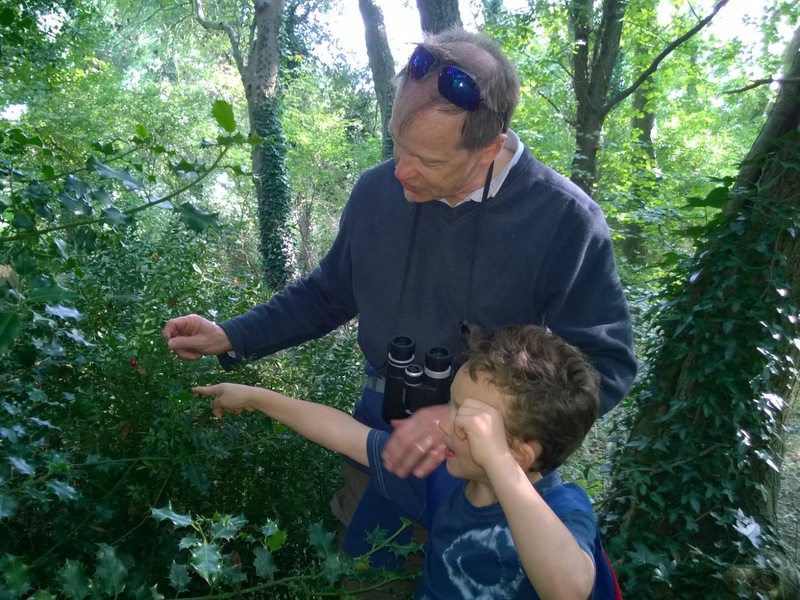 One of the great ideas they have had was to set up a series of herbal foraging walks with the highly knowledgeable and experienced former medicinal herbalist Ben Fairlight Edwards. 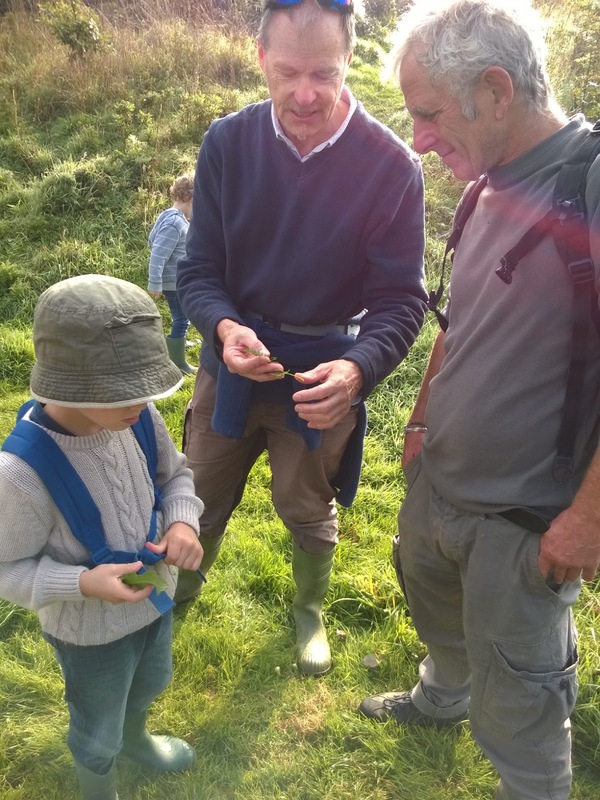 We've had the great pleasure of joining Ben on a couple of herb walks in the past, and so jumped at the chance to join in with this latest series. My degree in Environmental Biology included a fair bit of fieldwork and plant identification, and I have been fascinated with the medicinal uses of plants since I was very young, but before going out and about with Ben last year I hadn't actually put much of my reading to any use. This was because I'm a firm believer that a plant in the field can be a deceptive little blighter, being significantly different to the type specimen depicted in the book depending on it's conditions of growth, and therefore you never know for sure what something is until an expert puts a plant into your hands to feel and smell and really get familiar with. Making teas,balms and lotions with him last summer opened a whole new world to me and I'm now a confident maker of nappy balms, foot creams and hand rubs using the techniques he taught us and a few of the herbs I'm sure of, including the plantain plants which confused me greatly when I read about their herbal uses when I was a child - to me a plantain was a big green banana I'd seen in a grocers shop (Milton Keynes, where we lived, was pretty cosmopolitan place, I'm not sure it's something I would have seen in many other towns in the 1980s). Each time we go out I learn something new, or get something I'd forgotten embedded better in my brain. Ben is a mine of information on identifying and using plants we often overlook as weeds, bringing back to us the knowledge our ancestors would have incorporated into their daily repertoire of culinary and medicinal recipes. 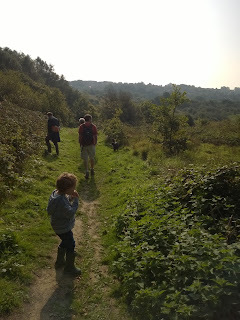 On this walk we crossed the train tracks into the top end of the Coombe Valley and discovered the plants of this area, including a beautiful swathe of Small Cow-wheat with it's little yellow snap-dragon like flowers. 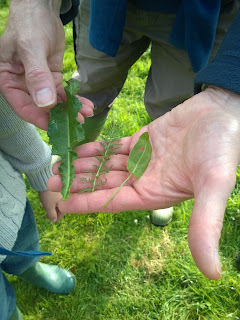 We learned how leaf margins and bases are important features for identification of plants, how plants are related or different to eachother, to smell, feel, taste and really get to know the common wayside herbs. For example fragrant Yarrow for staunching bleeding. I love the etymology of it's Latin name Achillea millefolium which reflects the story that it was given to Achilles by the centaur Chiron to use on battlefield wounds, with the millefolium part meaning thousand leaved and referring to the finely dissected foliage. 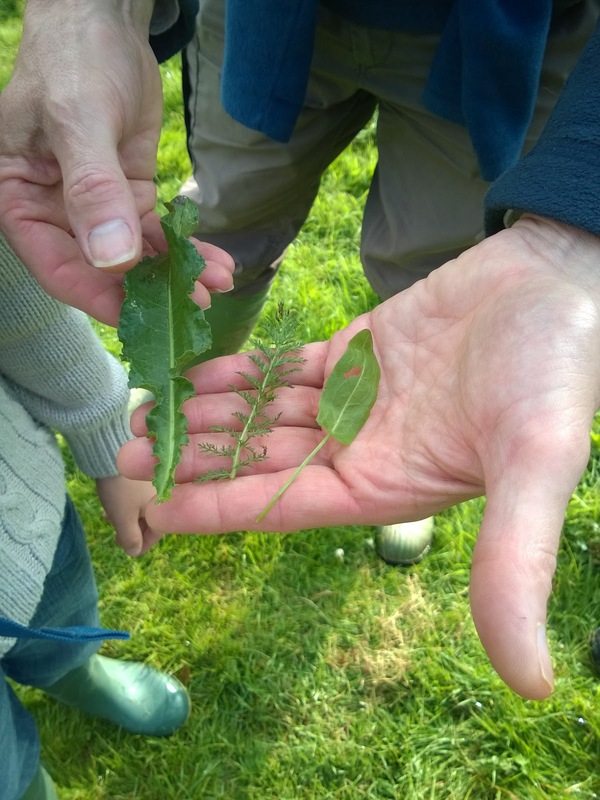 Sorrel, Rumex acetosa, or spinach dock, a trendy cooks ingredient with it's clean lemon acid bite that is hard to find in the shops but easy to find in the fields once you know what you are looking for. Curly dock, Rumex crispus, related to Buckwheat as Ben demonstrated in inviting us to look closely at the curiously shaped seeds. I had been used to considering every type of dock to be just a bit of a nuisance at the allotment, but I'm having to rethink my stance on it. We nibbled the flesh from rosehips (Vitamin C), savoured blackberries (bioflavinoid anthocyanins), had mixed reactions to hawthorn haws (for the heart) and pulled a variety of faces at crab apples (part of the rose family) and sloes (more anthocyanins, which pleasingly preserve well in vodka). A favourite for the kids was picking bramble tips, nettles and other herbs to add to the flask of hot water to make our tea ready for our picnic lunch. They were I'm afraid a little greedy with the tea, but Matt at least didn't feel he missed out as he's more a fan of Yorkshire tea bags than anything we might pick from a hedgerow, and much as I liked it I agree you definitely would feel odd dunking a chocolate hobnob in bramble tip tea. The tea tastes of autumn though and it's something that thanks to our foraging walks with Ben I enjoy with the kids regularly after rambling adventures with them around our local neighbourhood, where it's one of the few plants that reliably grows above dog soiling height. of Butchers Broom, which I first met on fieldwork in the Picos in Spain but spent years in British woods before coming face to face with it again. Ollie liked this prickly character with it's lone red berry, perched like that single Christmas decoration that every year eludes the trip up to the loft with the rest of the baubles and tinsel. Each trip I pick up something fascinating to remember, like the fact that the leaves of the Butchers Broom are not leaves at all, but a sort of flattened stem structure. 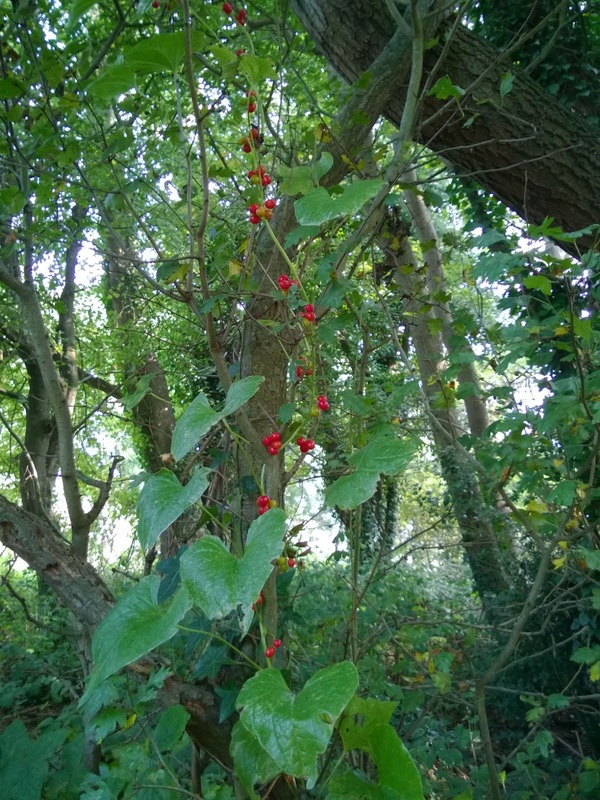 Or that my favourite hedgerow jewel, Black Bryony, isn't entirely native, but that this poisonous-berried relation of the Yam has been naturalised here for a long time. I didn't know we had our own maple, with delicate smaller leaves, an indicator of ancient woodland and hedgerows. The bigger, bolder sycamore is all I thought we had, and that's not quite a native either. We've lost so much of our connection with plants, been so drilled with 'don't touch, don't pick' messages that aimed to preserve rare flowers but which actually also stopped the last few generations having any relationship with the common weedy plants too. I noticed the difference walking along a lane at the local Pestalozzi village with a group of A-level and IB students a few years ago. The kids from Kenya, Nepal and around the world walked along holding small posies of wild flowers, wove flowers into their hair, made daisy chains and frequently reached out to touch and notice the plants. The local kids wandered along in a bubble, not touching anything but their phones. Hopefully opportunities like this one with Ben will help to redress this lost connection where we were told by well meaning information campaigns 'don't touch, it could be rare, or poisonous'. 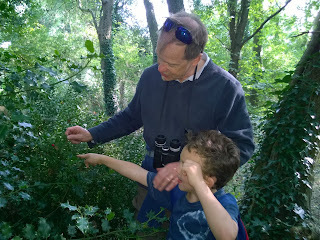 How about we teach our children to know the difference, to pick a little with sympathetically and with guidance, to appreciate the bounty in our hedgerows and playing fields, and perhaps to want to conserve the green spaces because they understand them and love them. I certainly can't thank him enough for taking the time to teach us, and thanks also to the Transition Towns group for making this particular series of walks available. 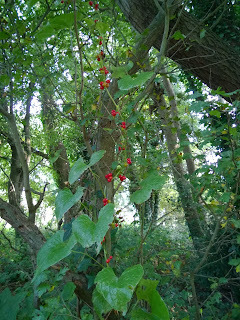 Note: please don't eat anything based on using my photos to identify it - a good field guide such as Francis Rose's Wildflower Key, a foraging book, or even better a walk with an expert is safest if you're a foraging novice. As I've mentioned in previous articles, I have trained my kids not to put anything in their mouth without showing me first - every single time. Also common sense with regards where you're picking - not from dog soiled areas, not from alongside busy roads etc... and the legal side of what you can forage and where is covered amply if you do an internet search relating to your local area. We don't have much here in Britain that will harm greatly by touch alone, but I know my biggest audience is actually in America currently and you guys do have some stuff you don't want to touch like Poison Ivy, so go carefully lovelies. Respect for potentially problematic plants isn't the same as fear of them, but we do still have to respect them.